Many people are now analyzing the newly-released documents concerning the assassination of John F. Kennedy, and most are hoping to find scraps of information that will help reveal Who Done It? But some of us are still intrigued by a different puzzle: What exactly They Done. We continue to ponder this issue because so much of what we have been told by the government has been contradicted by key witnesses, those who were closest to the action, and whose testimony was the most detailed and specific. 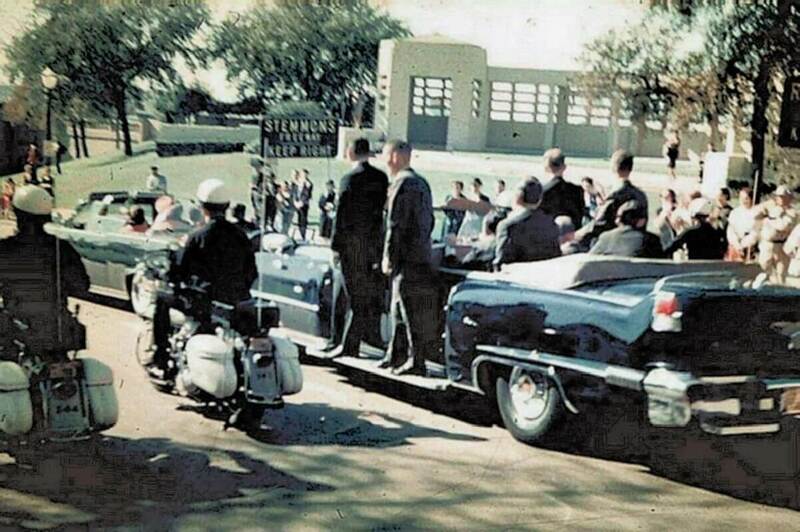 One such person is Glen Bennett, a Secret Service agent who rode in the back seat of the follow-up car just behind Kennedy on the day of the assassination. If what he said is true, then he saw something small but extraordinary—something that would mean that at least one bullet came from the front. Bennett said he was looking right at Kennedy’s back at the very moment he heard a shot, a second shot, and he saw it hit. It’s not what Bennett saw, but when he saw it, that is key: Photographic evidence shows that if he indeed saw this strike, it had to have happened after JFK was already reacting to an earlier strike. 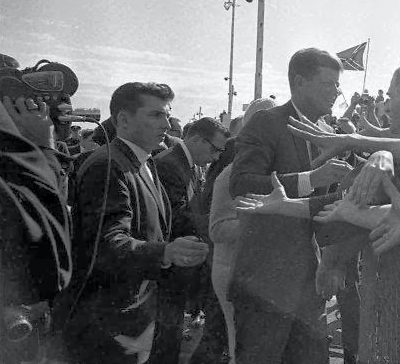 That earlier strike—by a separate bullet—led to an obvious reaction: Kennedy seemed to be grabbing at his throat. And, if the throat wound is not related to the back wound—then it has to have been an entrance. Promoters of the official story say Bennett could not have seen that shot because he was too far away. But you can see from the pictures that he was not so far. They also say such a wounding would be too small to see. Wrong again. You can perform your own experiments to see what is visible, and at what distances. Bennett did not describe in detail what he saw, but such a shot would look like a sudden, inward tenting in the jacket. I see no visible clue on films that suggests JFK is being hit in the back. It could have happened soon after the throat shot – or several seconds later, during what many described as a “flurry” when JFK was shot in the head. On the other hand, reactions to the first and last shots are easy to see. Evidence of the first is unambiguous at Zapruder frame 224. But he had to have been hit before that.The sound of the shot would have come after the bullet hit, but before JFK showed any reaction. Nor did Glen Bennett have time to react. He is in this photo and, as you can see, his upper body is turned to the right as he watches the crowd on the north side of Elm Street. According to his statement (see above), he would not yet be looking at Kennedy. 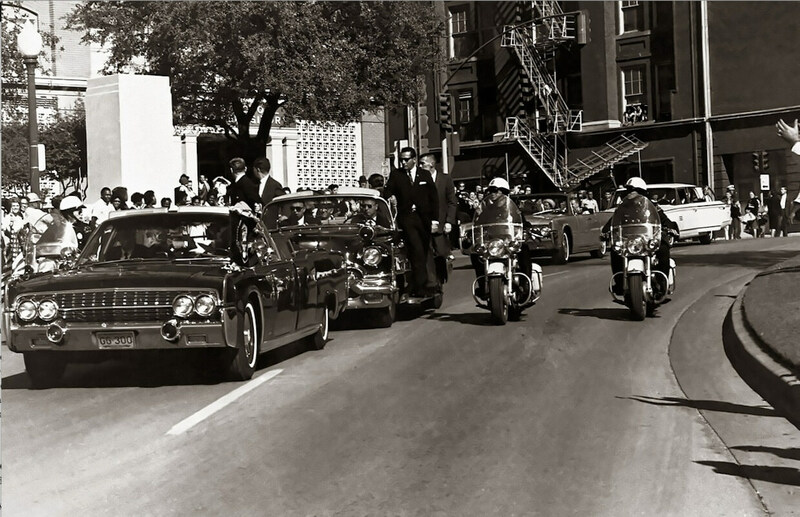 About three seconds later, James W. Altgens, an Associated Press photographer, also took a photo of the motorcade. The strange thing is, Altgens said he took that picture almost simultaneously with what he called “the first shot.” When questioned closely about the timing, Altgens swore that he heard no other shots or noises that could have been shots before this “first” one. Glen Bennett is also in this photo. People say he is still turned to his right here, but I have trouble seeing him at all. In any case, if Bennett, like Altgens, had not heard a shot before this moment, then I would not expect him to have reacted yet. Thanks to David Lifton, author of the best-selling book, Best Evidence, many assassination researchers ignore Bennett’s comments. Lifton—who believes that all shots came from the front, despite Connally’s back wound and other evidence—claims Bennett was lying. (See pages 77, 284-7, and 510-511 in the 1988 edition of his book). Lifton’s proof? The Willis and Altgens photographs. They both show Bennett looking off to his right. But Willis said he snapped his photo when the first shot was fired. How could Bennett be already facing the front at that moment? The same applies to the Altgens photo. Even if Bennett had heard the same “first” shot Altgens heard, how could he be reacting already? He would have been facing the front at the time of the second shot (the second shot he heard)—not the first. If I had to guess, I’d say JFK was hit in the back during the “flurry” at the end. Too bad we can’t question Bennett about it. Ironically, what Lifton considers proof that Bennett lied, is actually proof, though indirect, of a shot that came from the front.